Looking to feel uplifted and rejuvenated as a woman? 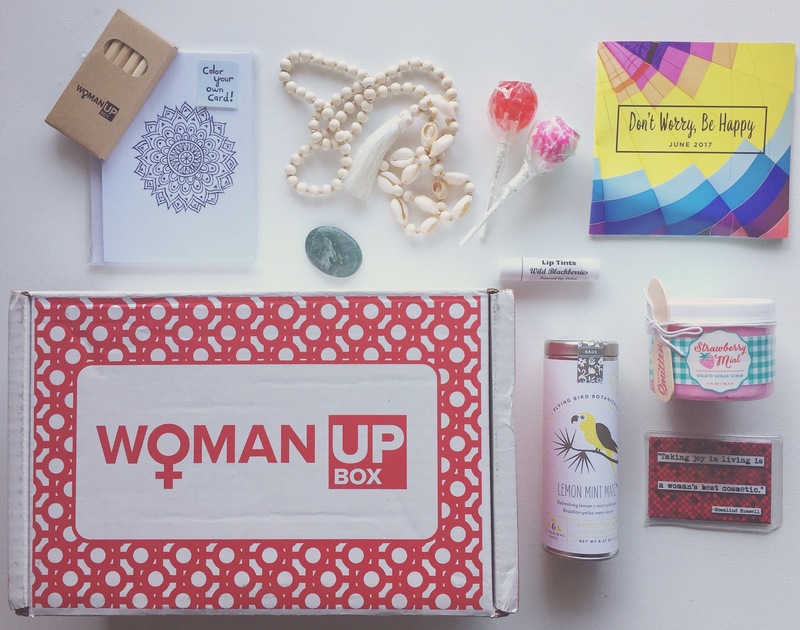 The Woman Up Box is a new subscription box created for ladies to indulge, uplift and empower. How you ask? Feel uplifting knowing they are donating 10% of profits to woman focused charities. Empower other woman by going for the suggested ideas in the Lift Up card. And indulge with gourment beauty products, spa and than products, treats and more! You’ll get 6-8 lovely items a month. Colouring cards and pencil crayons – something to ease your mind, colouring is actually a great way to relax and encourage your creativity. Stone – a worrystone, just rub it and let your worries fade away. Lollipops – pomegranate tangerine and strawberry mojito – yummy flavours, and although I’m not a big fan of lollipops, these ones are pretty good. Scrub – oooh my goodness. This is a strawberry mint gelato sugar scrub. Sounds delicous and smells so darn good! Mala head necklace – I like this long necklace, it’s pretty and goes well with most casual outfits. Tea – mmm a lemon, mint, Yerba maté by Flying Bird Botanical. Lip balm – this is a different type of balm, it’s a lip tint which is fun in Wild Blackberry flavour.